The region’s leading travel and hospitality platform recognizes luxury landmark as Best Business Hotel. Kuwait, 13 June 2017: Jumeirah Messilah Beach Resort & Spa, Kuwait’s idyllic resort, was recently awarded with the Best Business Hotel Award at the Sixth Edition of the Business Traveller Middle East Awards 2017 held at a glamorous gala ceremony in Dubai. 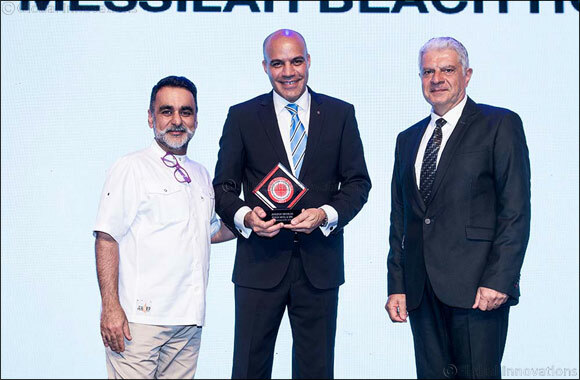 Ahmed Jarkass, Director of Business Development and Marketing at Jumeirah Messilah Beach Hotel & Spa, attended the event and received the coveted award on behalf of the hotel team. He said: “It is always an honour to receive recognition for the work we do and this prestigious award is a testament to the dedication of the entire team in our resort. The luxurious landmark offers the discerning business traveller a range of flexible facilities in its elegant business settings, including a fully-equipped Business Centre, long-staying residences and premier meeting spaces fitted to the highest standards. Whether a productive meeting or a private space required, the state of the art meeting rooms provide the perfect setting for business, complimented by exemplary services to ensure a seamless experience. For corporate guests, the unique Reef Room is ideal for cocktail receptions, the Messilah meeting rooms offer utmost convenience, the sophisticated Crew Lounge is preferred for trainings and seminars, the unique Al Sadu Room provides an open-air terrace, and the multi purpose-built Badriah, the largest ballroom in Kuwait, hosts large corporate events and large-scale exhibitions. With easy access to Kuwait’s Central Business District and airport, the landmark boasts extensive facilities making it the place to succeed for local and international executives.